Motorola’s upcoming Android smartphone has finally been revealed in a set of front-and-back pictures published online. Although not Motorola’s first Android-based phone – that award goes to the Dext - the Droid smartphone will likely be the firm’s first smartphone to run Android version 2.0 – aka éclair. 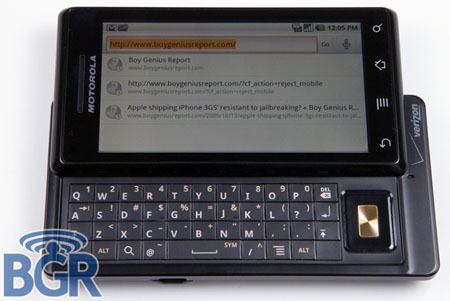 Droid is said to be slightly thicker than the iPhone 3GS, yet also the “thinnest Qwerty slider we’ve ever seen”, according to website Boy Genius Report, which appears to have had a one-on-one with the Moto smartphone. 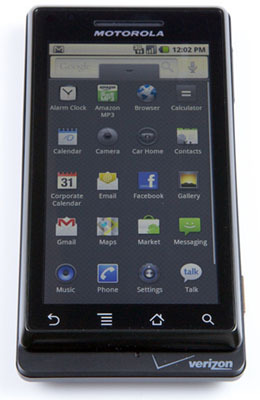 Texas Instrument’s OMAP3430 processor powers Moto’s Droid into a state where the phone “flies”, the report added. Droid will also reportedly ship with a docking station, enabling the device to transform into multimedia station. In this mode, the device could be used for desktop display of your local weather, the time, etc.